Google files with the SEC (summary), with an irrational valuation. Chris Klimas interviews longtime Mac game developer John Calhoun, who now works for Apple on Preview. Neither rewriting the system nor ditching it for someone else’s software was an appealing option, especially given that the reason to do so was essentially an internal issue and mostly invisible to the users. We decided instead to do the sensible thing—we rewrote DecisionPlus. Or, rather, we wrote a compiler that understood DecisionPlus and, rather than targeting the DecisionPlus virtual machine and runtime that was causing us problems, we targeted a newer and less restrictive system. CTM is offering a bundle of PowerMail 5 and SpamSieve for $65 ($45 for upgrades). 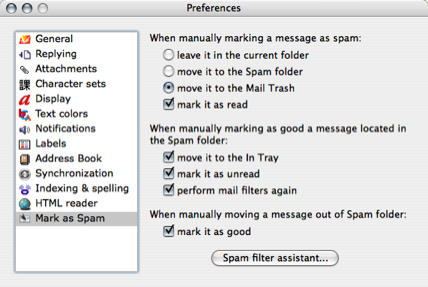 PowerMail 5 includes other improvements, which are being well received on the mailing list, but I’m not a heavy enough user of the product to judge, for example, how much faster it is than the previous version. It’s always frustrating not to find bugs until after shipping, but hopefully they’re fixed now. Here are three new Cortland cartoons from Matt Johnson. SpamSieve 2.1.3 is now available. The new version is easier to install, integrates with Eudora better, and (by request) now supports Outlook Express 5. As always, the change list is available. Accessing the registered function displays the first ‘Hello’ page. Clicking ‘Ok’ will then resume the function and display the second ‘World’ page. Clicking ‘Ok’ on that page exits the function. Late Night Software’s Property List Tools can convert property list files into AppleScript records and also save the records back to disk as property list files. read property list file "HD:Users:mjt:Library:Preferences:com.c-command.DropDMG.plist"
I’ve just gone through the experience of trying to configure CUPS, the Common Unix Printing System. It has proved a textbook lesson in why nontechnical people run screaming from Unix. Good UI design, and doing the right thing by Aunt Tillie, ought to be a matter of gut-level pride of craftsmanship.…None of this is rocket science. What Raymond is proposing, in fact, is no change at all. This idea, that the hard work of development is in building the underlying foundation, and that the easy part is writing a “GUI wrapper”, has been the Linux/Unix way all along. What I think would be a good start(TM) would be a program that interprets config files and turns them into GUI menus when possible, turning integers into fields, lists of commented out options into checklists/dropdown menus, etc. I know it wouldn’t be perfect but it would make editing a config file less scary for less experienced users. I’d still say that Apple’s managing of printers isn’t particularly intuitive these days. When you’re working on end-user software, and it doesn’t matter if you’re working on a Web application, adding a feature to an existing application, or working on a plug-in for some other application, you need to design the UI first. Gruber’s point is somewhat undermined by the printing system of Mac OS X, an OS Raymond holds up as a shining example, being a “GUI wrapper” around the same Cups system Raymond was criticizing. The April issue of ATPM is out.